I love to sniff a new book. The longing runs deep and it surges every time I walk into a bookstore. Well, I had a bookstore longing tonight. Not to write (although that remains)… but to wipe noses, cheer on sports, read bedtime stories and throw water balloons. The longing surged when I walked my puppy after dinner. We went down to the park and made a loop around the large field. 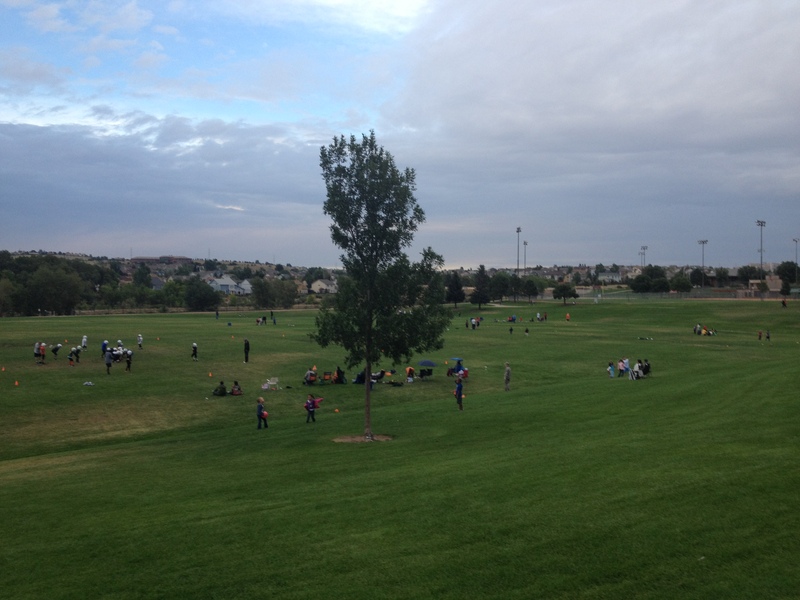 Kids were everywhere – playing football, chasing the soccer ball, hanging off the swing set. Some toddled, some ran and others rolled down the grassy hill all willy nilly like. I want to parent again. I want to love and chase and cheer and make up goofy stories just to make my kids laugh. It was that old bookstore longing, only towards a new adventure—a new purpose and hope that stirred in my belly. And it made me think of all of you. It made me wonder – what is your bookstore longing? Where do you go or what do you do that brings up that feeling? The feeling of longing and joy and hope and purpose? The yearning that stirs excitement in your heart for your future? As I pursue my longing through the adoption of our Haitian boys, I’d love to hear about your dreams and the steps you’re taking to pursue them. Will you please share them with me? I really would love to hear… Just click and share them in the comment section. This entry was posted in adoption, Family life. Tara, I’m so proud of you! I started back to college 2 months before my divorce was final….3 years later I graduated, just one month ago! You can do it…. What a beautiful longing. Thanks Elsa!! I’m praying with you about your hope, that it not be delayed one day longer than necessary. I remember those international adoption days…. I was just thinking of this subject this weekend. My divorce from my husband of 20 years was final 2009. It’s been 3+ years. I’m past that “I’m DESPERATE to be loved again” stage, and have come through some deep contentment with my singleness in the last few months. But I really long for that companionship and emotional intimacy again. Our church sermon series is on the Love and Respect book right now. This morning, as our pastor gave an awesome sermon, I thought, “I agree with everything he’s saying. I just hope I have another chance to put this great book and perspective into use again”. It’s kind of like my friend who’s baby daughter died soon after delivery said, “I can’t have anymore children now. I have three other healthy children, I’m just sorry my childbearing experiences ended on this sad note.” I feel that way, too. I’m sorry my last memories of marriage are of a man that left me, our 5 children, our daughter we adopted from China, and his ministry for someone else, now the stepmother to my kids. I know God is in love with me….and that nothing can compare to Him, but sometimes this journey gets lonely. Hi Michelle, what a journey you’ve been on! I’m sorry for all the hurt and heartache – you described it so well – the sadness that comes because your last memories were so painful. I’m sorry. I’m sorry also for the loneliness, but so glad you are reaching out to our God and know that He loves you! I pray that you would sense him in very special ways over the coming days and weeks. Thanks for writing! I’m with you on the smell in a bookstore. But unlike you I have yet to write the book. The longing tugs at the heart strings. I love the smell of books too but have a greater desire to smell the old “USED” books. I love books that have been cherished over the years. I have shelves of books I just can’t part with or put on my iPad. I love to hold books, even if old and worn out, in my hands and gently turn each yellowed page. It saddens me to see bookstores going out of business and being turned over to technology. I wonder if my grandchildren, and their children, will know what it is like to go to a library or bookstore full of books? My “SNIFF” is coming from a full working ranch full of animals and gardens where children, whose parents are incarcerated, can truly know they are cherished, beautiful, and loved. A place where they can heal. A place where whole families will be restored by HIS power, love, and grace. Looking forward to His V.I.N.C.E. camps (Victory in Christ Eternal).